Wasabi, also known officially as wasabia japonica, Japanese horseradish, or more traditionally ワサビ, is a plant that shares common traits with horseradish, cabbage and mustard, as they come from the same plant family, namely the Brassicaceae family. Wasabi has its origin in Japan and usually grows alongside rocky, water-rich areas such as mountain river valleys as well as streams. Wasabi has long been a part of traditional Japanese cuisine and is particularly associated with sushi and sashimi. In its most common form, wasabi is consumed as a paste that can be utilised in the food process such as sushi rolling, or as an accompaniment on the side. It is known principally for its pungent and strong flavour and for having a distinct ‘bite’ to it. Typically, wasabi is sold in several forms: more naturally in its stem form – which requires it to be finely ground into a paste for consumption, or in powder form – which is the far more common alternative, or lastly as a ‘ready-to-use’ paste, which is perhaps its most popular form for mass consumption especially in the west. However, it may come as a surprise to most, that the majority of the ‘wasabi’ served in restaurants that accompanies sushi or sashimi on the plate, more often than not – is not actually genuine wasabi, or is a very ‘watered down’ version of it. “In fact, by some estimates, only 5% of the wasabi served in Japanese restaurants around the world comes from the rhizome, or root, of a wasabi plant” (BBC, 2014). In reality, most of us have probably never tried the real thing. 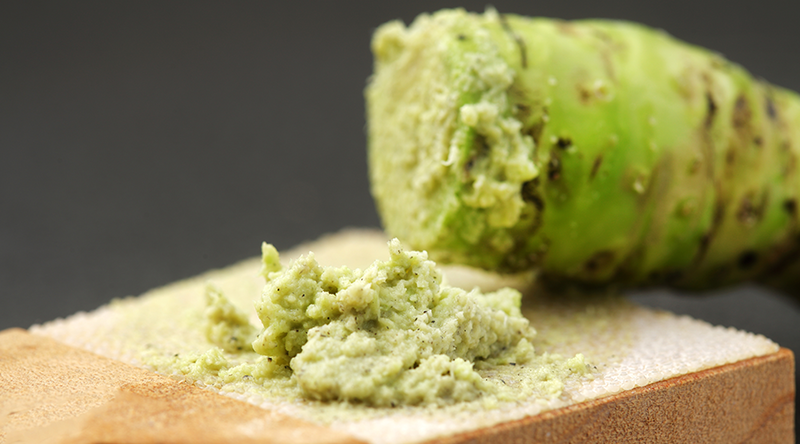 Mostly, the ‘wasabi’ that is readily available in restaurants or supermarkets is comprised of food colouring, mustard and the English variation of horseradish. So what is the reasoning behind this? Simply put the price. Wasabi has been deemed by most experts as one of “the most difficult plant in the world to grow commercially” (BBC, 2014) and therefore one of the most expensive. Like truffles, wasabi fetches a very pretty price on the market, making it one of the most lucrative plants to grow and sell commercially. However many a farmer has tried and failed in their endeavours to cultivate such a challenging plant, but for those who have succeeded – their efforts have been well rewarded for the plant fetches approximately $160 per kilogram. In addition to wasabi’s known culinary qualities, and its lucrativeness for successful commercial farmers; the plants’ potential health benefits are also now being explored as wasabi contains potassium, calcium, and vitamin C which are associated with anti-inflammatory properties. So as it turns out, wasabi may be better for us in more ways than one – if you can get your hands on the real deal, that is.